Going, going, gone! Aaron Boone's "walk-off" homer won the game for the Yankees. It was 2003 and they were going to the World Series again. Anyone who knows baseball knows the disappointment of that game for the Red Sox. It has been rumored that ever since they traded Babe Ruth to the Yankees in 1920 they'd been jinxed. They say that the "Red Sox were doomed to fail because of Babe Ruth and the baseball curse." No kidding! George Herman Ruth wasn't the luckiest kid in the world. He was so much trouble he got sent away to St. Mary's, a school mostly for orphans and "incorrigible" kids like "Babe." The only thing good about it was that Brother Matthias taught him to play baseball and eventually he signed on with the Sox. He still acted like a kid and claimed he could "burp louder than a tractor." Even if he was kind of childish acting, he was considered to be one of the best pitchers in the world and was getting to be pretty hot in the hitting department. He still was a rule breaker (so what!?) and he was asking a lot of money. Solution? Sell him to the Yankees. It was the start of the "Curse of the Bambino." 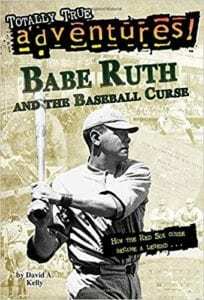 This is a great book of Babe Ruth, wild and crazy, full of fun and smooth. David Kelly has a real page turning hit here. There are lots of stats for the avid young fan to digest, but even if the reader isn't a die-hard baseball fan the story has a great flow and is fun to read. Did Lee Gavin really break that curse? You'll just have to decide for yourself. Quill says: A wonderful book for Red Sox fans, Yankee fans and anybody who loves baseball!